Logic Analyzer FrontPanel(tm) software is available for Windows XP, Windows 2000, Windows ME, Win95/98, and WinNT4.0. High speed operation (up to 500 MHz). Deep data buffers (up to 512K samples per channel). Simply put, the deeper the buffer the better. Continuously variable pre/post trigger position. This combined with the large data buffer gives you the power to store up to 512K events surrounding the trigger point. Up to 160 data input channels. High Impedance probes that minimize interference with the circuit under test (200Kohm by 3pf). Variable threshold voltage. Work with up to 12 different logic threshold levels at the same time. Variable between -6.52 and +6.12 volts like TTL, ECL, 3V logic, CMOS, or RS-232. Trigger out connector. Use this to trigger other instruments, like your scope. Statelist display. Timing display. Search function. Mixed mode display. Very high data bandwidth up to 100 MHz. 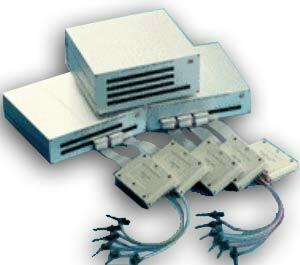 8 External high speed clock inputs with user definable combinations for flexible clock qualifying. Captures both state and timing simultaneously with one probe. Optional very high speed pattern generator with rates up to 100 Mpoints/s from 16 to 160 channels. Various ways to connect to your PC.